As per the Ford Motor Company survey, around 11% of European users prefer buying a car with sunroof as compared to car without sunroof in 2016 and over 40% of vehicles were sold with in-built sunroof in the same year. Growing demand for premium and luxury cars with attractive interior and larger sunroofs is expected to propel the global demand of automotive sunroofs. Glass is commonly used in manufacturing automotive sunroof owing to its better transparency. Nowadays, fibres are more preferred due to its light weight nature however, declining demand for convertible tops is expected to hinder the fiber automotive sunroof market growth. As per the Goldstein Research analyst, global automotive sunroof market size valued USD 5.1 billion in 2016 and is anticipated to grow at a CAGR of 10.8% during the period 2016-2024. The report covers the present ground scenario and the future growth prospects of the automotive sunroof market for 2016-2024 along with the changing competitive dynamics in every region. We calculated the market size and revenue share on the basis of revenue generated from supply based on material and sunroof type for different vehicles across the globe. 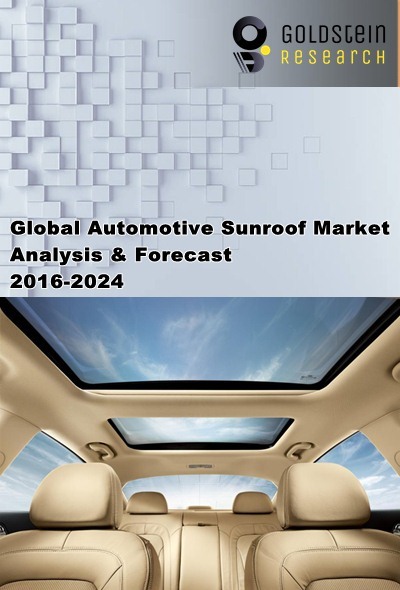 Automotive Sunroof Market Report, has been prepared based on an in-depth market analysis from industry experts. The report covers the competitive landscape and current position of major players in the global market. The report also includes porter’s five force model, SWOT analysis, company profiling, business strategies of market players and their business models. Global market report also recognizes value chain analysis to understand the cost differentiation to provide competitive advantage to the existing and new entry players. Our global market report comprises of the following companies as the key players in the Automotive Sunroof market: Aisin Seiki Co., Ltd., Inteva Products, LLC, Inalfa Roof Systems Group B.V, Nippon Sheet Glass Co. Ltd., Yachiyo Industry Co., Ltd. and Corning Inc.
Other high-flying vendors in the market are: Webasto SE, Johnan America, Inc., Automotive Sunroof Company, Valmet Automotive, Mitsuba Corporation, Magna, Sunroof Systems, Evana Automation, Kuber Automotive, Erickson Auto Trim LLC, ACS France SAS, Prestige Sunroofs, Retro Vehicle Enhancement Ltd., Arvin Meritor Commercial Vehicle Systems (Shanghai) Co., Ltd. and Shanghai Wanchao Car Sunroof Co., Ltd.
Based on types of automotive sunroof, the market is segmented into pop-up type, built-in type, tilt ‘n slide type, pop up & top-mount type, solar type and panoramic type. Panoramic sunroof type held 28% share of global market in 2016 and is expected to dominate the market owing to its wide adoption by auto giants such as Acura, Lexus, BMW, Scion, Pontiac, Mercedes C Class, Volkswagen, Porsche, and Tesla. Geographically, Europe is the dominating region for automotive sunroof market and accounted for 34% share of global market in 2016. Asia-Pacific automotive sunroof market is expected grow at a CAGR of 13.0% during the forecast period. Latin America region is potential market for automotive sunroof, owing to the expanding automotive industry in countries such as Mexico, Peru, Brazil and Columbia. Further, the report states that complexities in maintenance and operation of automotive rooftop are one of the major restraining factors for market growth. High initial cost in designing and maintenance of automotive rooftop marker is inhibiting the growth. Moreover, improper installation leads to leakage, electrical failures and poor calibration of the sunroof system may hinder the automotive sunroof market growth. What is the total market size by 2024 and what would be the expected growth rate of automotive sunroof market? What are the factors that affect the automotive sunroof market and what would be the expected demand over the forecast period? 8.2.1. Aisin Seiki Co. Ltd.
8.2.4. Nippon Sheet Glass Co. Ltd.
8.2.5. Yachiyo Industry Co., Ltd.
8.2.19. Retro Vehicle Enhancement Ltd.
8.2.20. Arvin Meritor Commercial Vehicle Systems Co. Ltd.
8.2.21. Shanghai Wanchao Car Sunroof Co., Ltd.